PBS KIDS has announced the premiere date of its newest show: SPLASH AND BUBBLES from The Jim Henson Company (DINOSAUR TRAIN, SID THE SCIENCE KID) and Herschend Enterprises (Dollywood, Harlem Globetrotters). Using groundbreaking digital puppetry technology, the animated series will help children learn marine biology and ocean science concepts while building social-emotional skills. SPLASH AND BUBBLES will premiere Wednesday, November 23, 2016, on OETA. Digital content related to the series, including games, apps and parent and educator resources, will be available beginning in fall 2016. Created by John Tartaglia (“ImaginOcean,” “Johnny and the Sprites”), SPLASH AND BUBBLES is designed to encourage kids ages 4-7 to explore the natural undersea world. Developed with an advisory panel of top marine biologists, digital innovators and educators, SPLASH AND BUBBLES is grounded in a marine biology curriculum that focuses on themes of diversity, individuality, interconnectedness and the celebration of learning and discovery. The series also introduces the concepts of ecological balance and the importance of taking care of the ocean. Funded in part by the Corporation for Public Broadcasting, SPLASH AND BUBBLES follows the adventures of Splash, a yellow fusilier fish who has migrated all over the ocean before settling down in Reeftown, where he befriends Bubbles, a Mandarin dragonet whose vivid orange and electric blue coloring matches her colorful personality. Until Splash came along, Bubbles and most of the other Reeftown residents had no idea what lived beyond the cozy confines of their coral walls. Together, Splash, Bubbles and their friends explore the world’s undersea habitats, make new friends and learn about the many different ways life looks and lives in the ocean, celebrating the importance of diversity along the way. “We are excited to partner with two world-class brands, Henson and PBS, to create life-changing emotional connections between kids and the ocean. Through SPLASH AND BUBBLES-themed experiences, we can bring the same memories created every day in our aquariums to children’s living rooms and lives,” said Andrew Wexler, CEO of Herschend Enterprises. 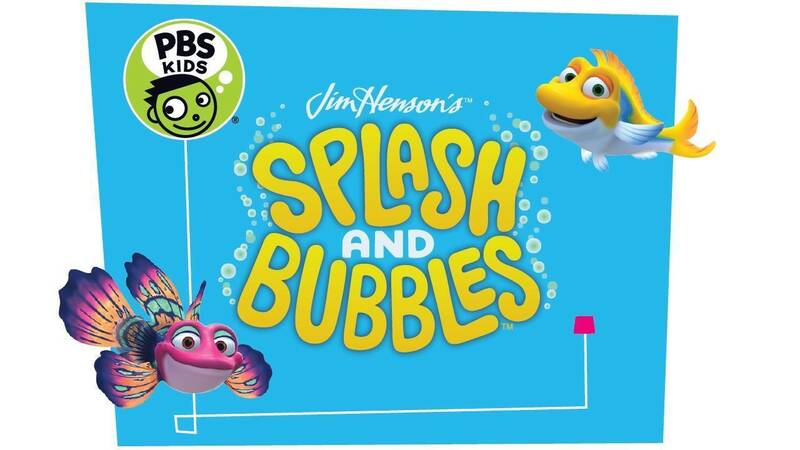 SPLASH AND BUBBLES is executive produced by Lisa Henson and Halle Stanford of The Jim Henson Company, Julie Phillips and Merrill Puckett-Miller of Herschend Enterprises, as well as John Tartaglia, Michael Shawn Lewis and Jill Shinderman. Tom Keniston is producer and David Skelly is supervising director. The Jim Henson Company oversees all distribution and merchandising for the property and Herschend Enterprises administers all themed entertainment rights.